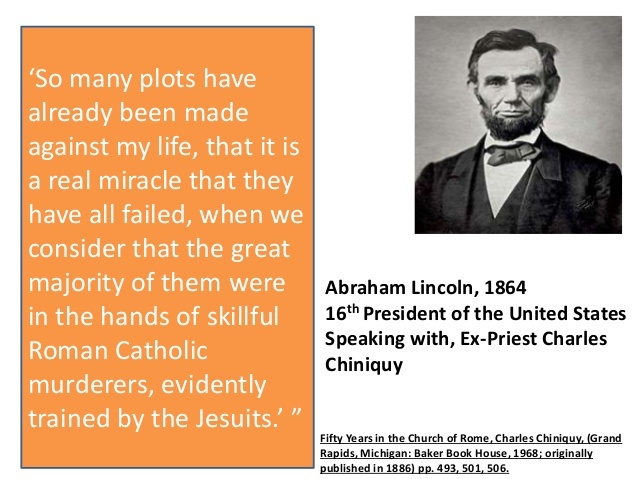 The aim of the Jesuits in this country is to ultimately extricate the Roman Church from its responsibility in the murder of Lincoln by exonerating Mary E. Surratt and her son John by placing the whole blame on John Wilkes Booth—the Protestant. The recent activity in this direction of these Leopolines—the Knights of Columbus—is most significant and interesting to observe. Wide publicity was recently given through the official press of the Knights of Columbus of an offer of five thousand dollars to "any one who can prove that John Wilkes Booth was a Roman Catholic" is one move in the plan. The Surratts must be white-washed before the Catholic Church can clear its skirts. The documentary evidence pertaining to this tragedy has been so carefully and completely removed from the public eye that they feel it safe now to openly refer to the death of Lincoln. But for years his name never passed the lips of either the priests or the press of Rome! With a desire to get at the truth we have made a study of these two characters. There is much to convince the fair-minded investigator that John Wilkes Booth had been a pervert to the Roman Church. The evidence in both the trials of the conspirators and John H. Surratt shows that Booth was frequently at Mass in various Roman Churches. The fact that he wore an Agnus Dei bronze medal at the time of his death which was taken from his neck by Surgeon General Barnes as his body lay on the Montauk, which had become corroded from the moisture of his body showed long wear. Only three weeks prior to the murder as Rear Admiral Baird tells us, he met Booth coming out of a Vesper Service at a Roman Church in Washington. This alone of course would not be conclusive, but taken together with other evidence strengthens the conclusion, that he was not only a professed Romanist, but that he was a devout one. The close associates of Booth from his arrival in Washington from Montreal the middle of November 1864, until his flight after the murder, were fanatical Romanists. His first visit the next day after he registered at the National Hotel was to the little Roman Church at St. Mary's near Bryantown. He had attended Mass and presented his credentials to the Roman Catholics, Drs. Queen and Mudd; was entertained by them and inquired for the whereabouts of John Surratt on that occasion, whom he met shortly afterwards in Washington and became a constant, almost daily, visitor at the Surratt home on H street which was the meeting place of the Romish priests of Washington and vicinity. The complete confidence which existed between Booth and the Surratts, in the mind of the writer, is sufficient evidence that these schemers were taking no chances on any heretic. The fact that every member of this household was a Romanist and undoubtedly a member of the Knights of the Golden Circle further confirms this belief. Having absorbed the Jesuit psychology during my early girlhood training, and understanding the peculiar tie that binds all devout Romanists together, there is not the slightest doubt in my mind but that John Booth was not a full-fledged pape. Add to this the fact that Booth himself had taken the Jesuitized oath of the Order of the Knights of the Gold Circle, given in full in this book, which no honorable or sincere Protestant's conscience would permit him to blacken his soul with, and we have another link in the chain of circumstantial evidence. He was under the influence of the small group of Confederate leaders in Montreal, who in turn were the most abject tools and associates of the French priests in that city. Considering these and other things we will be justified in concluding that if John Wilkes Booth was not a professed Romanist, he might as well have been and most certainly he was nothing else. There is no professed Catholic assassin in all history, within the writer's knowledge who was a more effectual dupe of the priests of Rome and their lay agents than this once brilliant, care free, talented young man whose most distinguishing characteristic, barring his kindly courtesy, was his reverence and devotion to his mother. Without wishing to excuse or condone the cruel, cowardly act which snatched Abraham Lincoln away from us at the moment when his great wisdom, kindliness, and broad charity would have guided the re-construction as no other could, but the aim is to call attention to the instigators, higher up—the priests of Rome who were accessories both before and after the fact, and who have always escaped without even censor or suspicion, leaving their tools to pay the price! Booth was chosen for this bloody deed with keen discernment and fine discrimination by these ecclesiastical plotters against this government. That he was a young man without much depth of character is to be conceded, for they do not seek strong characters to execute these wicked and dangerous deeds. No doubt the Jesuits followed Booth for months, studying him, finding his most vulnerable point, delving into his very soul, before they decided to cast on him the leading role. There were many advantages in his selection. His profession and the well-known loyalty of the Booth family to the Government placed him almost above suspicion. His knowledge of changing his appearance, his expertness in the use of firearms, horsemanship, fencing, etc., his pronounced personal magnetism and easy, graceful manner and above all his childlike vanity without egotism, all tended to, from their standpoint make him an ideal victim of their subtle influence. One other point: Booth, even if he had no previous idea of the responsibility or knowledge of the oath he was to take when he entered the Golden Circle, must have fully realized after, that had he failed to carry out instructions after he had drawn the fatal blank, it meant his own certain death. Geniuses are usually so absorbed in the line of work in which their gift inclines them, that they are often easy victims of stronger designing or unscrupulous minds, and the dramatic instinct in this unfortunate young man would tend to make him particularly susceptible to the weird ceremonies, garbs, etc., of the Roman Church and its psychology. Booth, by several authors, is charged with entertaining this conspiracy of murder and destruction from a monetary object. The value of a dollar does not go hand in hand with talent or genius. If so, it is the exception to the rule and John Wilkes Booth was not an exception. Actors make their money easily and quickly and the rule is that they let it go as easily; their improvidence is proverbial. I believe it is unjust to attribute Booth's part in this affair to a mercenary motive and am inclined to think that he very probably used much of his own money during his operations. The several genuine oil speculations in which he was the loser, shows him to have been short on business qualifications and the E Z mark in that respect which characterized the members of the profession in his day. That John H. Surratt on the contrary, was mercenary and that money held a high place in his estimation is plentifully evidenced. He talked about the large sums of money he expected to get and repeatedly boasted to Weichmann and displayed the large bills and twenty-dollar gold pieces in his possession while carrying on the Secret Service work in his trips between Richmond, Washington and Canada . . . . He began to dress expensively and it was because of his ultra-fashionable appearance that the attention of the tailor, Reed, was attracted to him on the fatal Good Friday as he waked down Pennsylvania Avenue from the National Hotel. It was his habit to show his money and talk of it to his friends in a boastful way. The testimony of St. Marie shows that he was still given to this while a member of the Pope's Army. The difference in the filial devotion and the lack of it is very pronounced between these two young men. Surratt's immediate flight to Canada the morning after the tragedy at Ford's Theatre, where he had directed and "called the time," where he remained in safety under the care of the Roman priests La Pierre and Boucher, during his mother's arrest, trial, conviction and execution; his heartless desertion of his mother and only sister, is unparalleled as the most concentrated selfishness and base ingratitude and the only charitable thing to be said, is that it was due greatly to his theological training—or it might have been owing to the espionage of his priestly protectors. GEN. T.M. HARRIS "NAILS" PRIEST WALTERS' ATTEMPT TO WHITEWASH MRS. SURRATT. "From the time of the trial of the conspirators by a military commission, and of the execution of Mrs. Surratt by the order of President Johnson, Father Walter, a secular priest of Washington City, has made himself conspicuous by his efforts to pervert public opinion on the result of the trial of the conspirators by the Commission. Whilst rebel lawyers, editors and politicians have bodily assailed the lawfulness of the Commission and have denounced it as an unconstitutional tribunal, and have characterized the trial as a star chamber trial, as a contrivance for taking human life under a mockery of a judicial procedure, with no purpose of securing the ends of justice, Father Walter and other priests whose sympathies were with the Southern Confederacy have earnestly seconded their efforts by the invention and circulation of cunningly devised falsehoods. "Father Walter has every now and then bobbed up with the assertion of Mrs. Surratt's entire innocence. Knowing that not one in a thousand of our people have ever read the testimony on which she was convicted, he feels that he can boldly assert, 'There was not enough evidence against her to hang a cat.' He has also become bold enough to state as facts what the evidence shows to be falsehoods. As an example of this: In an article in the Catholic Review he asserts in regard to Mrs. Surratt's trip to Surrattville on the afternoon of the day of the assassination that he had ordered her carriage for the trip, which was purely on private business, on the forenoon of that day, and before it was known that the President would go to the theatre. Why, if this was true was it not proven in her defense? There was no such testimony produced. The testimony on this point against her was that shortly after two o'clock on that afternoon she went upstairs to Weichmann's room, tapped at the door, and when it was opened she said to Mr. Weichmann, 'I have just received a letter from Mr. Calvert that makes it necessary for me to go to Surrattville today and see Mr. Nothey. Would you be so good as to get a conveyance and drive me down? Upon Weichmann's consenting to do so, she handed him a ten dollar bill with which to procure a conveyance. Surely, there is no evidence here that a carriage had been ordered already, as Weichmann was left free to procure a conveyance where he might see fit. "Weichmann went downstairs, and as he opened the front door, he saw John Wilkes Booth, who was in the act, as it were, of pulling the front door bell. Booth entered the house. "When young Weichmann returned, after having procured the buggy, he went up to his own room after some necessary articles of clothing, and as he again descended the stairs and passed by the parlor doors he observed that Booth was in the parlor conversing with Mrs. Surratt. In a little while Booth came down to the front door steps and waved his hand in token of adieu to Weichmann, who was standing at the curb. "When Mrs. Surratt came and was in the act of getting into the buggy, she remembered she had forgotten something, and said, 'Wait a moment, until I go and get those things of Mr. Booth's.' She returned from the parlor with a package which was done up in brown paper, the contents of which the witness did not see, but which was afterwards shown to have been the field glass which Booth carried with him in his flight. This glass Booth sent to Lloyd by Mrs. Surratt, with a message to have it, with the two carbines and two bottles of whiskey, where they would be handy, as they would be called for that night. Lloyd swore that this was the message delivered to him by Mrs. Surratt in the private interview she sought with him in his backyard on his return home that evening, and that in accordance with these instructions he delivered them to Booth and Herold about midnight that night. "Now, let us see about the private business on which she professed to be going, and on which she claimed at her trial that she went. The letter from Mr. Calvert was a demand for money that she owed him, and was written at Blandensburg on the 12th of April. On the afternoon of the fourteenth she presented herself to Weichmann and claimed that she had just received it. It would seem very strange that it took this letter two days to reach her at a distance of only six miles. She claimed that she must go and see Mr. Nothey who owed her and get money from him to pay her debt to Mr. Calvert. Mr. Nothey lived five miles below Surrattsville, and as she claimed that she had just received Mr. Calvert's letter, it was impossible that she could have made any arrangement with Nothey to meet her at Surrattsville that day. She did not meet him there, neither did she go to his house to see him. When she arrived at Surrattsville she took Weichmann into the parlor at the hotel and asked him to write a letter for her to Nothey, which he did at her dictation; and this she sent to Mr. Nothey by Mr. Bennett Gwinn, a neighbor of his who happened to be passing down. "Now, in view of all these facts, can any one see how her private business was in any way subserved by her trip to Surrattsville on that afternoon? She could as easily have written to Mr. Nothey from Washington as from Surrattsville. A postage stamp, a sheet of paper and an envelope would have saved her six dollars, the cost of her trip, and would have served her business just as well. The truth is that this talk of going on private business of her own was all a fabrication, first to deceive Mr. Weichmann as to the object of her trip, and then to be used, should it become necessary, in her defense. We have already seen what her real business was. "Father Walter falsifies again in the article referred to saying that she did not see Lloyd on that afternoon, but delivered the things to her sister-in-law, Mrs. Offutt. Both Lloyd and his sister-in-law testified to her interview with him in his backyard, and Lloyd testified as to what passed between them on that occasion. "It would seem that Father Walter is going on the theory that we have gotten so far past the time, and that the testimony has been so far forgotten that he can foist upon the public any statement that he may please to fabricate. We would kindly remind the reverend Father that no ultimate gain can be derived from an effort to suppress the truth. Neither can it be obliterated by our prejudices. We may misconstrue facts, but we cannot wipe them out by a mere stroke of a pen; and a fact once made can never be recalled. But I am not done yet with this Father. He prefaces his article in the Review with the statement that he heard Mrs. Surratt's last confession and that whilst his priestly vows do not permit him to reveal the secrets of the confessional, yet from knowledge in his possession he is prepared to assert her entire innocence of this most atrocious crime. He means that we shall understand that were he at liberty to give her last confession to the world, he would say that she then and there asserted her entire innocence. "Will Father Walter deny that under the teachings of the Roman Catholic church he had an absolute right, with her consent, to make her confession public on this point? Nay, more, could not Mrs. Surratt have compelled him to do so in vindication of her good name, and of the honor of the church of which she was a member? And having this consent, was it not his most solemn duty to proclaim her confessed innocence in every public way through the press and even from the very steps of the gallows? "Why was not that confession made public? "Why was it not reduced to writing and signed with her own hand? "Why has it not, in its entirety, been given to the world? "Why must the public wait twenty-seven years, and instead of having the full confession, be required to content itself, in so great a case, with a mere assertion from the reverend Father, based on his alleged knowledge? Aye, just there's the rub! "That confession of Mrs. Surratt's would have proved very interesting reading, and might have let in a flood of light on some of the places that are now very dark; it would, indeed, have shown how far Mrs. Surratt was involved in the abduction and assassination plots and to what degree she was the willing or unwilling tool of her son, and of John Wilkes Booth. That confession would have shown the object of Booth's visit to her on the very day and eve of the murder. It would have explained what she had in her mind when she carried Booth's field glass into the country and told Lloyd to have the 'shooting-irons' and two bottles of whiskey ready on that fatal night of the fourteenth of April. And if she did not explain satisfactorily every item of testimony, which bore so heavily against her, then her last confession was worth nothing. "Father Walter never had at any time Mrs. Surratt's consent to make her confession public, and he dare not do so now after twenty-seven years have elapsed since he shrove his unfortunate penitent. "Now, what has become of the Father's priestly vows, behind which he has always been hiding? Or was all this a mere piece of acting, to give the counsel a point from which to denounce the government, the Commission, and all who were concerned in visiting justice upon the assassins? "We believe it to be true that the laws of his church do not forbid him to make public, with her consent or command, her last confession on this point, and that the Father in making the statements he does at this late day is simply practicing sleight of hand upon the public. It is a very strange circumstance, too, that whilst Payne, Arnold, O'Laughlin, Atzerodt, and even John H. Surratt, admitted their connection with one or the other of the conspiracy plots, Mrs. Surratt has not left one word or line after her to explain away the incriminating evidence brought against her. The reason is plain; she could not have explained anything without involving herself and her son and giving away the whole case. "For twenty-six years Father Walter and his rebel coadjutors have kept a paragraph going the rounds of the papers, stating as a fact that all the members of the Commission, but one, are dead, and that they died miserable deaths, which marked them as the subjects of heavens vengeance and that some of them perished from the violence of their own hands, being crazed with remorse. "The truth is that at this writing, April, 1892, all the members of the Commission are alive except General Hunter and General Ekin. General Hunter lived to over four score years and General Ekin to seventy-three. The present writer is nearly seventy-nine and is still able to vindicate the truth in the interest of a true history of his period. Is it not high time that the American people should be fully informed as to this most important episode in their history, in order that they may not be misled by men who were not the friends, but the enemies, of our government in its struggle for its preservation and perpetuation." The above statement of facts is sufficient to refute the lying priest Walter and block the Roman Church's mad efforts to subvert this damning evidence of its own participation in Lincoln's murder. Testimony of Miss Anna Ward, for the Defense, June 3rd. "I reside at the Catholic Female Seminary on Tenth Street, Washington. I have been acquainted with Mrs. Surratt six or eight years. I have not been very intimate with Mrs. Surratt. She always bore the character of a perfect lady and a Christian, as far as my acquaintance with her extends. "I received two letters from John H. Surratt postmarked Montreal, Canada, for his mother. I received the second the day of the assassination . . . . I answered his letters to me, and left them with his mother as I supposed that she would be glad to hear from him. I have not seen him since." This Miss Ward, by the way, was twice brought into the trial, sufficient participation, it might seem, to involve her in conspiracy. Mr. Weichmann testified that in March, 1865, Surratt invited him to accompany him to the Herndon Hotel to see about securing a room. When they arrived Surratt called for the housekeeper, a Mrs. May Murray, and asked her to have the room in readiness for the man, not mentioning the name, whom Miss Ward a few days previous, had spoken to her about. The housekeeper seemed not to remember until Surratt further reminded her that it was "For a delicate gentleman" who was to have his meals served in his room. With this refreshing she remembered. Surratt then told her that the gentleman would occupy the room on the following Monday. Later on, Weichmann met Atzerodt coming along Seventh Street, who told him to answer to his question as to where he was going, that he was going to the Herndon House. Weichmann then said, "Is that Payne that is at the Herndon House?" Atzerodt answered, "Yes." Then Miss Ward, this Catholic school teacher, was the one who prior to the crime, had been delegated, to establish an alibi for John H. Surratt by calling at the Surratt house on the day of the assassination with a letter which she had purported to have received that day from John Surratt in Canada. She proffered this information to Louis Weichmann, who happened to be at home. Weichmann did not read the letter, which disappeared and was never introduced into the evidence. REV. B. F. WIGET FOR DEFENSE, MAY 25th. "I am president of Gonzago College, F Street between Tenth and Eleventh. "It is about ten or eleven years since I became acquainted with Mrs. Mary E. Surratt. I know her very well, and I have always heard everyone speak very highly of her character as a lady and as a Christian. During all this acquaintance nothing has come to my knowledge respecting her character that could be called un-Christian. "I have a personal knowledge of her character as a Christian, but not as to her character for loyalty. My visits were all short and political affairs were never discussed; I was not her pastor. I first became acquainted with Mrs. Surratt from having her two sons with me. I have seen her perhaps once in six weeks. I cannot say that I remember hearing her utter a disloyal sentiment, nor do I remember hearing anyone talk about her being notoriously disloyal before her arrest." REV. FRANCES E. BOYLE FOR THE DEFENSE, MAY 25th. "I am a Catholic priest. My residence is St. Peter's Church. I made the acquaintance of Mrs. Mary E. Surratt eight or ten years ago . . . . Have always heard her well spoken of as an estimable lady. I do not undertake to say what her reputation for loyalty is." REV. CHAS. H. STONESTREET, FOR THE DEFENSE, MAY 26th. "I am pastor of Aloysius Church in this city. I first became acquainted with Mrs. Mary E. Surratt twenty years ago. I have only seen her occasionally since. At the time of his (sic, this?) acquaintance there was no question of her loyalty." REV. PETER LANIHAN, DEFENSE, MAY 26th. "I am a Catholic priest. I reside near Beantown, Charles County, Md. I have been acquainted with Mrs. Surratt, prisoner at the bar, for about thirteen years; intimately so, for about nine years. In my estimation she is a good Christian woman and highly honorable. Have never on any occasion heard her express disloyal sentiments. I have been very familiar with her, staying at her house." "Is it not permitted to make use of the purely and properly mental restriction? 443-2. It is sometimes permitted to make use of the restriction largely; that is to say, improperly mental, and also of equivocal words, when the meaning of the speaker can be understood . . . . Besides, the good of society demands that there should be a means to lawfully hide a secret; now there is no other way than by equivocation or restriction . . . . One is permitted to use this restriction even under oath . . . . A culprit interrogated judicially, or not lawfully, by the judge, may answer that he has done nothing, meaning: 'About which you have the right to question me.'" The canon law of the Roman church does not concede the right of any civil authority to question or cross-question a priest. Not only so, but the canon law of the Roman church automatically excommunicates any Catholic layman who would bring a priest into a civil court. Consequently none of these priests' testimony was worth the paper it was written on in the matter of truth, and they were at perfect liberty to swear to anything they chose, or to whatever would seem best for the interest of the prisoner and their church. "If a judge interrogates on an action, which must have been committed without sin, at least a mortal one, the witness and the culprit are not obliged to answer according to the judge's intention." REV. N.D. YOUNG, DEFENSE, MAY 26th. "I am a Catholic priest. I reside at the pastoral home of St. Dominick's church on the Island and Sixth Street, Washington City. I became acquainted with Mrs. Mary E. Surratt eight or ten yeas ago. My acquaintance has not been very intimate. I have occasionally seen her and visited with her. I had to pass her house about once a month, and I generally called there—sometimes stayed an hour. I have heard her spoken of with great praise. She never uttered any disloyal sentiments to me." Certainly the above testimony makes the position of Mrs. Surratt and her church beyond question, but to say that any one of these priests did not know that she was DISLOYAL TO THE UNION and entertained a deep hatred for President Lincoln, to whom she, like many others, attributed the loss of her wealth, might be acceptable to non-Romanists who do not understand the relation of such a woman to her priest, but certainly no ex-Romanist could be deceived by it. TESTIMONY OF THE REV. B.F. WIGET. Question: "State your residence and profession." Answer: "I am connected with the Gonzaga College on F Street, Washington, between Ninth and Tenth." Question: "How long have you resided in Washington?" Answer: "With an interruption of four months I have resided here four years." Question: "Look at this photo (marked exhibit G) and state whether you have known this person from whom it was taken." Answer: "John H. Surratt, I should think." Question: Have you known Surratt many years? Answer: "Many, many years, yes, sir. I knew him when he was about 12 years old. He was one or two years under my tuition." EXTRACTS FROM THE TESTIMONY OF LOUIS J. WEICHMANN. "Mrs. Surratt and her family are Catholics. John H. Surratt is a Catholic and was a student of divinity at the same college as myself. I met the prisoner, David E. Herold at Mrs. Surratt's house on one occasion. I also met him when we visited the theatre when Booth played Pescara; I met him at Mrs. Surratt's in the country in the spring of 1863 when I first made his acquaintance. "I met him (Herold) in the summer of 1864 at the Piscataway (Roman Catholic) church. These are the only times to my recollection I ever met him . . . . I generally accompanied Mrs. Surratt to church on Sunday. Surratt never intimated to me nor to anyone else to my knowledge that there was a purpose to assassinate the President. He stated to me in the presence of his sister shortly after he made the acquaintance of Booth that he was going to Europe on a cotton speculation. That three thousand dollars had been advanced to him by an elderly gentleman whose name he did not mention, residing somewhere in the neighborhood, that he would go to Liverpool and remain there probably two weeks to transact his business; then he would go to Nassau and from Nassau to Matamoras, Mexico, and find his brother Isaac . . . . His character at St. Charles College, Maryland, was excellent. On leaving college he shed tears and the president approaching him told him not to weep, that his conduct had been excellent during the three years he had been there, and that he would always be remembered by those in charge of the institution . . . . I had been a companion of John H. Surratt for seven years (in answer to a question). No, I did not consider that I forfeited my friendship to him in mentioning my suspicions to Capt. Gleason. He forfeited his friendship to me by placing me in the position in which I now stand, testifying against him. I think I was more of a friend to him than he was to me. He knew I had permitted the blockade runner at the house without informing upon him, because I was his friend, but I hesitated for three days; still when my suspicions of danger to the government were aroused, I preferred the government to John Surratt. My remark to Captain Gleason about the possibility of the capture of the President was merely a casual remark. He laughed at the idea that such a thing could happen in a city guarded as Washington was." "When they inquired for her son, she said. 'He is not here: I have not seen him for two weeks.' This was a sufficient answer, but her guilty conscience would not let her stop here, she had to add, 'There are a great many mothers who do not know where their sons are.' Let us ask ourselves at this point, how many mothers in Washington City at that hour of that eventful night were lying awake expecting their house to be searched by detectives? Our inner consciousness will unerringly dictate the answer, 'Not one who was innocent of crime.' It is only necessary to say further, in regard to this defense set up of an alibi that although there is no more common defense resorted to by criminals, because there is none more easy of establishment, there was never perhaps in all the history of jurisprudence a weaker and more unsuccessful effort made to establish it, than in this defense. "Probably no witness had ever been subjected to the severe grilling which Louis Weichmann received during these trials, his testimony at John H. Surratt's trial being precisely the same, and he could not be shaken by the badgering which the defense's lawyer resorted to. A lifelong persecution followed in consequence." During a recent interview the writer had with a relative of his who was with him during his last illness she said: "No one will ever know the sadness of Lou's life nor dream of how he was persecuted for simply telling the truth. The day before he died he motioned for a pencil and paper and before a witness wrote: 'To All Lovers of Truth, I, Louis J. Weichmann, being of sound mind and memory, do declare that everything that I testified to at the trials of Mary E. Surratt and John H. Surratt, was the truth, the whole truth and nothing but the truth, so help me God. (Signed) Louis J. Weichmann.' He died the next day." The "persecution" was that they accused him of swearing away the life of an innocent woman who had been a kind friend to him. For many years Mr. Weichmann was under the protection of the government where he held a public position in Philadelphia. He was practically excommunicated from the church although he in later years attended. On the other hand John H. Surratt, conspirator and assassin, was protected and helped by the priests up until his death April 22, 1916. After Surratt's release from prison on a technicality he went to Rockville, Md., where he delivered a lecture which he prepared with the ostensible purpose of going on the lecture platform. He only delivered it once. The public sentiment, even in the South, was strong against him. He then secured a position in the public school at Montrose, near Rockville, where he taught several years. The writer, in making the picture of the Surratt house produced here, had a talk with the present tenant, a Mrs. Wm. Penn, whose stepmother was a pupil of John Surratt's while he taught at Montrose. Mrs. Penn has a linen pocket handkerchief, hemstitched, with the name Surratt embroidered in large script letters across the comer of it, which her step-mother, a Mrs. A.M. Higgins, was given by the owner, John H. Surratt. Some years later he secured a lucrative position with a Baltimore steamship company where he remained until just a short time before his death. He left a widow and several grown children, one of whom, William, is an attorney in the "Monumental" city. On looking up the death notices some months ago when the writer was in Baltimore for that purpose, the protection of the Catholic church was shown by the information that a High Requiem Mass was to be said for the deceased and that the funeral would be private, interment would be at Bonnie Brae. As a matter of fact, the body was brought quietly to Washington and buried in the family lot at the left side of his mother. The significance of this probably is that some day in the future the Roman Catholic church plans to erect a memorial to John Surratt and his Martyred mother. In a talk with the superintendent of Mt. Olivet cemetery as we stood by the graves, he proffered this information, he being himself a Catholic. "The hanging of this woman was one of the greatest crimes ever, committed. We would erect a monument to her in a minute, if we could." I asked him why they did not do it. He said: "We wouldn't dare now. The feeling for Lincoln is too strong." On pressing the matter further with him, I found that he had no personal knowledge of the case and knew nothing but what he had been told by his church. Before closing this chapter I cannot but call your attention to God's Wondrous ways of just retribution. Contemplate the small lonely headstone, labeled merely "Mrs. Surratt" on the outskirts of the Roman Catholic Cemetery in Washington, the scene of her wicked work and within a gun shot of the magnificent white marble Lincoln Memorial as it stands overlooking the Potomac River, erected to the memory of the great American whom she and her priestly sponsors had tried so energetically to destroy because he was the living type of the triumph of Popular Government and every act of his beautiful, clean, upright public life was a stinging rebuke to the tyrannical, corrupt System, of which Mary E. Surratt, her son and the other papal assassins were legitimate products! Reverting to the Secret Treaty of Verona, we recall that the "high contracting parties," on being convinced that the system of representative government is incompatible with monarchial principles . . . engage mutually in the most solemn manner, to use all their efforts to put an end to the system of representative government and to prevent it form being introduced in those countries where it is not yet known. "Article 2. As it cannot be doubted that the liberty of the press is the most powerful means used by the pretended supporters of the rights of nations . . . the high contracting parties promise reciprocally to adopt all the proper measures to suppress it . . . ."
The process of destruction has gone on steadily from the assassination of the five presidents in the United States which begun in 1841, and has continued at intervals, and which finds us without a semblance of a free press. After sixty years of activity by these foreign enemies within our borders what do we find? We find a subversion of free speech; a subversion of a free press; we find a denial of the right of the American people to peaceable assemblage; we find the complete separation of Church and State, the very basis of our form of government being a dead letter; we find the freedom of conscience being attacked; we find our great IDEA of public education being viciously undermined and sapped by a great system of parochial schools wherein are taught the principles of the old concept of monarchial institutions. And by whom is this concerted plan of destruction being carried on. principally? By the priests and lay members of the Roman Catholic Church. Upon what authority is this work of subversion being operated? By the ex-cathedra mandates of the Popes of Rome, conveyed to their subjects in this country through Encyclical Letters. We find that the Roman Catholics who comprise less than one-sixth of the population, have been the dominating power in our political affairs and of late years have headed almost every national, state and municipal office from the President down to the dog catcher. The PLUNDERS of Hog Island and the Emergency Fleet under E. N. Hurley are matters of Congressional Record which mounted up into the millions. Mr. Hurley is a Roman Catholic and Knight of Columbus. The Aircraft Scandal under the supervision of John M. Ryan, ardent Roman Catholic and Fourth Degree Knight of Columbus, ran into the billions and was also subject of investigation. Admiral Benson who was advanced in a most unusual and peculiar way by his sponsor Woodrow Wilson, is a Fourth Degree Knight of Columbus and violated the spirit and the letter of this Republican Government by accepting a foreign title from the Pope of Rome. Admiral Benson is a member of the Household of this alien ruler, who never has ceased to claim his right to temporal power for one moment since he was forced to relinquish it by the Italian People, Sept. 20, 1570. This disloyal act has never been rebuked by the American people whom Admiral Benson is supposed to represent. Knighthood is not a spiritual acquisition, nor was it bestowed as such. It is a foreign title given in recognition of his service to the Pope of Rome who claims temporal sovereignty and allegiance from his subjects in every country. One of the aims of the Knights of Columbus is to restore the temporal power of the Pope. Roman Catholics are serving under a Citizenship diametrically opposed to American citizenship. American Citizenship is based upon the contention that the only authority to rule must come from the consent of the governed. So you see the Pope denies today the right to think. The Romanists of this country are obliged to obey and inculcate these treasonable principles. It is because of this citizenship that the Roman Church has established its gigantic parochial school system. "Be it enacted by the Senate and House of Representatives of the United States of America, in Congress assembled, that whenever it shall be established to the satisfaction of the Postmaster General that any person is engaged, or represents himself as engaged in the business of publishing any obscene or immoral books, pamphlets, pictures, prints, engravings, lithographs, photographs, or other publications, matter, or thing of an indecent, immoral, or scurrilous character, and if such person shall, in opinion of the Postmaster General, endeavor to use the Post Office for the promotion of such business, it is hereby declared that no letter, packet, parcel, newspaper, book, or other things sent or sought to be sent through the Post Office, or by or on behalf, of or to, or on behalf of such person, shall be deemed mailable matter, and the Postmaster General shall make the necessary rules and regulations to exclude such non-mailable matter from the mails." The Record shows that Holy Names Societies of the Roman Catholic Church immediately became active and sent to their Representatives many petitions urging the enactment of these measures into laws. And the priests claim the right to be the judge of those who would have the "Gift of reason or intelligence." Roman Catholic citizenship is inimical to American citizenship. Roman Catholic citizenship is represented by the confessional box. American citizenship is represented by the BALLOT BOX. "Be it enacted by the Senate and House of Representatives of the United States of America, in Congress assembled, that the Postmaster General shall make the necessary rules and regulations to exclude from the mails those publications, the avowed and deliberate purpose of which is to attack a recognized religion, held by the citizens of the United States or any religious order to which citizens of the United States belong." In January, 1915, Representatives Fitzgerald and Gallivan had each introduced a Bill substantially identical with the Fitzgerald Bill herein before set out. At the hearing on those Bills before the House Committee on the Post Office and Post Roads, Roman Catholic Representative James P. Maher, of Greater New York, stated frankly that the Bills had been introduced to shield sixteen million Roman Catholics and twenty thousand Roman Catholic priests from public criticism, by excluding, The Menace, the Yellow Jacket, and similar publications from the mails. These laymen, tools of the Romish Church would strangle our Press to prevent criticism of their religion and 20,000 bachelor fathers! And now let us see how well the Roman Catholic Church requires its members to observe and accept the above concentrated treason to our POPULAR GOVERNMENT. The strangulation of a Free Press in this country is to be completed through legislation. We call your attention to the three Bills which the Knights of Columbus have been trying to engineer through for the past seven years under the photographs of the Pope's Catholic Citizens, Messrs. Fitzgerald and Gallivan and the papalized Hebrew, one, Isaac Siegal. That the right of peaceable assemblage is almost a thing of the past in this country is proven by the numerous mobs instigated and led by the priests and Knights of Columbus and their hoodlums in the various cities from coast to coast. June 12th, 1913, the Protestant people of Oelwein, Iowa, invited Jeremiah J. Crowley, ex-priest and author of The Parochial School: A Curse to the Church and a Menace to the Nation, to address them in the theatre of that town on the subject of the public school question. At the instigation of the Roman Catholic priest of that city who delivered his sermon the Sunday before the Crowley lecture, some two thousand Romanists led by the Knights of Columbus and their hoodlums, mobbed Mr. Crowley as he was leaving the theatre with some of his friends, and beat him severely. The Rev. Spurgeon was finally rescued, taken to a hospital where he was found to have sustained internal injuries and lay very ill for three weeks. The Rev. Spurgeon was a heretic and a Mason. On Feb. 4th, 1915, Rev. Wm. Black, ex-priest, at that time a Congregational minister, was delivering a course of lectures, enroute to the California Coast, where he was to have testified that while he was a Roman priest and a Knight of Columbus he had taken the Jesuit oath on the Congressional Record cited heretofore. The Reverend Black had reached Marshall, Texas, where he was to deliver two lectures. He gave his first lecture on the public school question in the auditorium of the City Hall at Marshall, Feb. 3rd. About five o'clock in the evening on Feb. 4th, Mr. Black and his body guard, a Mr. J.A. Hall, ex-soldier and expert shot whom he took with him on his trip, were returning from a walk about the city. On reaching his door four men standing at the end of the corridor nearby approached him. They asked if he was Mr. Black and permission to come in and speak with him a few minutes. The Rev. Black opened the door and invited them in. The visitors first of all informed him that they were members of the Knights of Columbus Council of Marshall; that they understood that he intended to deliver another lecture "against their church" that night. Mr. Black assured them that they were correct. Then the spokesman, a prominent attorney, Ryan by name, said, "No you won't. We will give you just fifteen minutes to pack your suitcase and get out of town." Mr. Black coolly informed them that he intended to deliver his lecture; that he would relinquish his American constitutional rights for no man. On rising from a shoeblacking case where he had been sitting, John Rogers, a leading architect of that vicinity who had drawn up plans of the hotel in which they now were, sprang toward him, pinioned his arms and in shorter time than it takes to tell it, Black's body was riddled with bullets, and in the melee John Roberts' body fell across that of Blacks', being also instantly killed. Copeland, a leading banker the third Knight of Columbus—Catholic citizen—received a wound from which he will never fully recover and promptly received the consolations of his church in the corridor, outside the room where they carried him. It may be of interest to know that the priest was in the lobby of the hotel when Black and Hall entered to go to their room. Through political influence, these surviving K.C. participants in this cowardly assassination went free. April 6th, 1915, the Rev. Dr. Joseph and Mary Slattery, ex-priest and ex-nun, of Boston, Mass., were called by Protestant Americans to deliver some lectures in Chicago, Ill. They were lecturing in a Masonic hall on the south side of the city. In the early part of Dr. Slattery's talk a mob of Roman Catholic hoodlums and members of the Knights of Columbus left their hall which was just across the street, entered the Slattery meeting and proceeded to start a riot in true Roman style, by calling Dr. Slattery "a liar." At a signal from a man wearing a Roman collar from which he drew a handkerchief which had concealed it, the riot started in earnest. Chairs and furniture were smashed, men and women were beaten indiscriminately and disfigured by the use of brass knuckles and black jacks. The telephone wires in the hall and even the nearby drugstores had been cut and it was fully three-quarters of an hour before they had any response from the Fourth Degree Knights of Columbus policeman. The speaker and his wife made a miraculous escape. The windows of the automobile in which they were driven were shattered by bullets. These Roman thugs entered street cars, attacked the passengers who had not been at the lecture and knew nothing about a riot. They pulled the trolleys off the wires and derailed and demolished several cars. So much for Roman Catholic citizenship in the great city of Chicago. "The plain, significant and undisputed fact is that an American citizen was denied the right of free speech, guaranteed by the constitution of Massachusetts, and that the authorities failed to protect him. That the mob was the result of a premeditated plan appears clear from the fact that the lecturer was not permitted even to begin. "We want to know whether this sort of thing is to continue, whether it is possible that we are entering upon an era of Catholic tyranny in this state, whether henceforth in this state criticism of one church, and only one, is to be indulged in only at the risk of life and limb. We demand of the cardinal that he publicly state his attitude and enforce his authority in such a manner as shall make Catholic mobs impossible in this state. If the cardinal fails to accede to our demand, we shall know how to interpret his continued silence and shall act accordingly. "We demand that the public authorities bring to justice the leaders of the mob and that the courts impose suitable punishment. A failure here will prove the constitution and laws of Massachusetts mere scraps of paper, and will forever debar our state, the nursery of liberty, from criticizing those Commonwealths where lynching goes unavenged. We say this advisedly, for, according to the beliefs of both our fathers and ourselves, liberty of speech is more precious than life. "But more than this is required. The only adequate reparation which can be made for this public outrage is a public atonement. This, to our mind, should take the form of an arrangement with Mr. Leyden by the citizens of Haverhill, by which he shall speak in Haverhill on the topic already advertised, and shall be protected in his rights by the city and state at any cost. If he then transgresses the laws against slander or incendiary speech, let him be proceeded against by due process of law." The entire body of the Protestant clergy of Haverhill, thirteen in number, appeared before Mayor Bartlett and Commissioner Hoyt, on April 7, to protest against the outrage, the inefficiency of the police and the equally disgraceful failure of the department of justice to ferret out, arrest and punish the ring leaders of the mob. "I speak in behalf and by the authority of the entire Protestant clergy of the city of Haverhill. "We deplore, and we feel indignant about the lawlessness which overran this city last Monday night. Our city has been disgraced before the country, and only the people of this city can remove the disgrace which is ours today. "We are not bigots. We have the highest charity for all who worship God in their own way and according to the dictates of their own conscience. "But we are also American citizens, and we are the accredited representatives of the morals and religious interests of this city. We hold inviolable the great principles of freedom of speech and freedom of the press, subject to the laws of libel and incendiarism, after the fact, which have been established by all the people, and which only the people can abrogate. "A mob has overrun our city. Churches have been broken into and desecrated by that mob. The homes of unoffending and innocent citizens have been stoned. In some cases lives have been threatened and placed in jeopardy. We cannot forget so long as the mob is permitted to be victorious, and its leaders glowing in the fact that they have trampled under their feet the most sacred rights of all our people. We will not forget until the principle of free speech has been impressively vindicated by the law-abiding element of this community itself"
"The Enemy within our borders." "The Public vs. parochial schools." "The Suppressed Truth about the Assassination of Abraham Lincoln." The church early in the evening was surrounded by a mob of about 2,000 Catholics some of whom forced their way in and filled up the auditorium. After listening for about three quarters of an hour, at a whistle from the leader of the mob which was the signal to begin, windows were broken, chairs were smashed, literature torn and scattered all over the hall. In response to a riot call from the downtown station (police at that precinct there would not respond) two wagon loads of officers stepped out, all of whom but one were Knights of Columbus. I know this because they admitted it to me. Such wide publicity of my meetings has been given by the local and anti-Roman press of K. of C. mobs in San Francisco, Sept. 22nd and Sept. 26th, 1921, that it is not necessary to dwell on them. Only a few weeks ago we read of the mobs of the meetings of the Baptist minister, ex-Monk Eli M. Erickson in Chicago, Ill., who speaks upon his conversion from Romanism to Protestantism. But again the priests of Rome denied Rev. Erickson his American rights. This mobbing is not confined to ex-Romanists. That splendid patriotic worker and eloquent lecturer, Wm. Lloyd Clark, of Milan, Illinois, has, in spite of Rome's vicious mobs, time without number, held the torch of American patriotism up for the last thirty-five years. For the most part he was almost single handed and alone. Mr. Clark has been rotten-egged, shot at, arrested and jailed, dozens of times, but he has never ceased to batter at these assassins of Liberty. In closing, I will leave it to my reader to decide whether I have proven my contention in the beginning of this book that the assassination of Abraham Lincoln and four other presidents is but a part of the great conspiracy which was outlines in the Secret Treaty of Verona to destroy this the most formidable Republic. That the execution of this conspiracy in Lincoln's case, was delegated by the Pope of Rome to the Jesuits aided and abetted by the priests of Canada and Washington, D.C., in the United States and their lay agents, the Leopoldines. That instead of the use of bullets and bayonets, their method has been and is still, to destroy from within by the subversion of all of the free institutions upon which this Republic is based. That the church of Rome has established a separate citizenship to promote its teachings and by its enormous wealth a large proportion of which has been obtained by unconstitutional and illegal appropriations from public funds; that with this wealth (over two and a half billion dollars worth of church and other religious property, for the most part exempt from taxation) it has by a system of intimidation and bribery corrupted our free press and is in control of every avenue of publicity, so that the American people remain in almost total ignorance of its pernicious activities, which, if not curbed, will succeed in accomplishing its object in these United States. For the further information of the reader, allow me to impress it upon you, that the present Pope Pius Xlth is the Cardinal Ratti, whom the late Pope sent to Poland on the express mission of inducing the makers of the new constitution to restore the Roman church as the State church, a feat which the gentleman covered himself with papal glory, by accomplishing, an act no doubt, which earned him the Pontifical throne. Also remember that Pius XIth stands for just what all popes have stood for. That he stands against everything Freemasonry and Americanism represents. Solution—"Put only Americans on guard."